California’s new governor is urging Los Angeles teachers and school officials to resume contract negotiations and end a massive strike by educators in the nation’s second-largest school district. Thousands of teachers are walking picket lines in pouring rain after their union failed to reach a deal with the Los Angeles Unified School District on issues including salary and class sizes. Schools remain open. Superintendent Austin Beutner told a news conference that some schools are well-attended, and others aren’t. Mayor Eric Garcetti tells KNX News Radio in Los Angeles that the city has deployed additional police and other resources to keep kids safe. Thousands of teachers striking the nation’s second-largest school district are rallying in downtown Los Angeles despite rain sweeping across Southern California. The teachers plan to march from City Hall to the headquarters of the Los Angeles Unified School District. 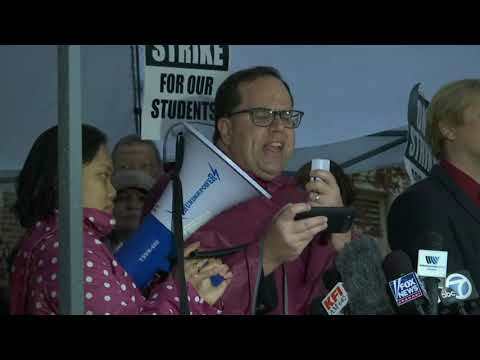 Teachers went on strike Monday after lengthy contract negotiations failed. Superintendent Austin Beutner told a news conference that all 1,240 K-12 schools are open and students are safe and learning. Beutner says about 3,500 people are protesting outside schools and those rallies have been peaceful. The superintendent says the district is ready to resume bargaining anytime. The Los Angeles Unified School District says all elementary, middle and high schools are open despite a strike by the teachers union. Superintendent Austin Beutner tells KCBS-TV it will be a normal day, with buses picking up students who will be learning. Members of United Teachers Los Angeles started picket lines Monday morning after lengthy negotiations with the nation’s second-largest school district failed. Some parents and their children have joined teachers protesting outside schools. Tens of thousands of Los Angeles teachers are striking after contentious contract negotiations failed in the nation’s second-largest school district. Members of United Teachers Los Angeles voted last year to walk off the job for the first time in 30 years if a deal wasn’t reached on issues including higher wages and smaller class sizes. The strike began Monday. The district says the union’s demands could bankrupt the school system. It’s projecting a half-billion-dollar deficit this budget year and has billions obligated for pension payments and health coverage for retired teachers. Schools will remain open. The district hired substitutes to replace staffers who leave schools for picket lines.